New York, NY December 14, 2009 Jewelry enthusiasts, fans of K.Brunini Jewels, and Roseark’s high profile clientele joined forces Thursday, December 10th to view the new K.Brunini BODY ARMOR collection. The celebration took place at Roseark, hosted by owners Kathy and Rick Rose and honored Katey Brunini’s line of survival gear. Marissa Tomei, Louanna Rawls and other K.Brunini clients enjoyed the steel drum duo and a blessing by Eagle Woman at the costume-requested party which had guests “embracing their inner warrior”, confirmed the hosts. Born in the mountains, at 14,000 feet, upon a vista in Telluride, the BODY ARMOR collection from Katey Brunini is the final chapter in her Shapes of Strength series. The designer’s goal throughout: to strengthen women with potent images found in nature. “These eternal symbols of protection are both tribal and elegant; physical reminders to stand up for what we believe in…to weather storms and survive in lost seas,” states Brunini. 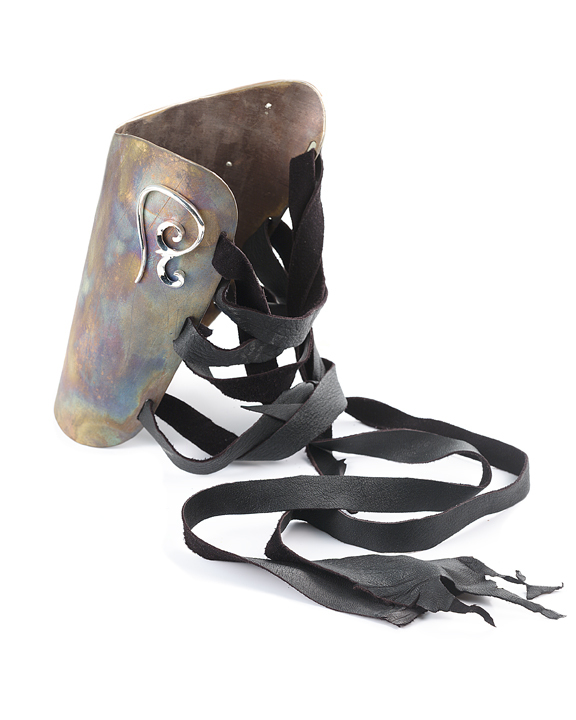 The jewelry in BODY ARMOR features water buffalo horn earrings, sterling silver tribal image pendants, functioning sterling silver sundials, 18K gold compass pendants, and fire-blasted sterling silver cuffs and shin guards (ranging in price from $900 to $22,000). These amulets can be passed from generation to generation in sentimental celebration of womanhood. BODY ARMOR is our ammunition, melting renaissance sundials and compasses with a futuristic Mad Max and Metallica… Brunini started this organic ode to empowerment with her Twig collection in 1998. Since then, Vertebrae, DNA, Skipping Stones, Spider Web, Objects Organique and Spirit Animals have graced her ever evolving line of fine jewelry and artifacts.